Serial Control View is separate from the Alternate Serial Control interface. Serial Control View enables you to manage serials in a single tabbed interface. This view also enables you to bind units. 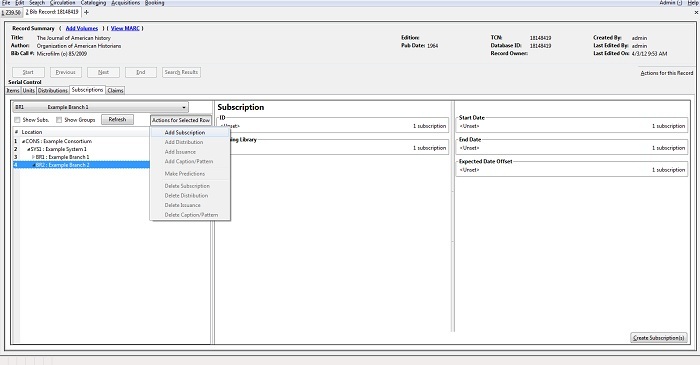 Serial Control View consists of five tabs: Items, Units, Distributions, Subscriptions, and Claims. Units and Claims are not functional in 2.0. Select the branch that will own the subscription. Right-click or click Actions for Selected Row, and click Add Subscription. Enter the date that the subscription begins in the start date, and click Apply. You must enter the date in YYYY-MM-DD format. Enter the date that the subscription ends in the end date. This field is optional. When finished, click Create Subscription(s) in the bottom right corner of the screen. You can add notes to the subscription by clicking Subscription Notes. These notes are currently viewable only in the staff client by clicking on the Subscription Notes button.